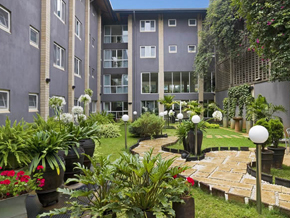 Country Lodge is located just outside downtown Nairobi business district in the Upper Hill area. The Hotel caters for business clientele looking to have an extended Nairobi stay at the hotel while taking advantage of the business facilities and related services designed and offered by Country Lodge. Country lodge hotel is located in upper hill, Nairobi at the Second Ngong Avenue Road; 18 km from Nairobi Jomo Kenyatta International Airport.It was founded to cater for the business traveler without any compromise on comfort, safety, quietness or cleanliness.The Country Lodge and Fairview are set in 5 acres of tropical gardens.Breakfast is served in the Country Lodge restaurant other meals are available at any of the bars and restaurants on the Fairview part of the campus. Airport transfer from Nairobi Jomo Kenyatta International airport or Wilson airport to Country Lodge Hotel or transfer from Country Lodge Hotel to Nairobi Jomo Kenyatta International airport or Wilson airport.